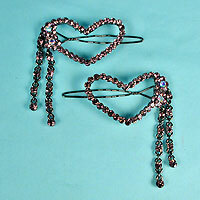 Set of two crystal rhinestone heart barrettes with two strands of dangling stones. Color: pale yellow. Hue: cornsilk. color code: #FFF665. 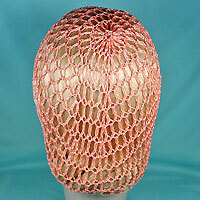 Measurements: width 1-5/8", height 2-1/4"
Crocheted snoods in 100% rayon. 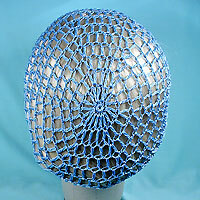 To wear a snood put the snood bag over the back of your head, catching your hair in it. The elastic will hold it in place or you can secure it with hair pins. Color: pale yellow. Hue: Hibiscus. color code: #FFF997. 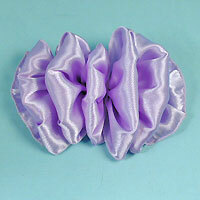 Measurements: width 7", length 7"
Large puffy ruffled hair bows on butterfly claw clips. 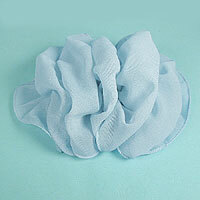 These bows are made from organza with a sparkly sheen. They come in a rainbow of vibrant colors. 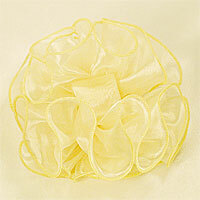 Sewn with a nylon filament in the hem, they keep their shape well with a minimum of care. The clip is covered with the same fabric and the color of the clip matches the bow where available. Otherwise black, white or clear may be used. If you want a different size just note it in the instructions when you check out. Color: pale yellow. Hue: Banana. color code: #FFF4C9. 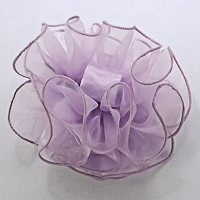 Measurements: width 5.5-6", height 3.5", length 6"
Large ruffled, sheer chiffon hair bows are the perfect accessory for a quick hairdo. We have several colors to choose from. 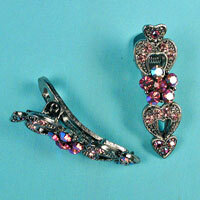 These bows are attached to a butterfly clip also known as a claw clip, jaw clip or salon clip. If you don&squot;t find your color use contact to send us a message and we will make one just for you. Measurements: width 5-5.5", height 3", length 5-5.5"
Pav? 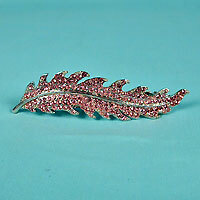 crystal rhinestone barrette fashioned in a long leaf design. 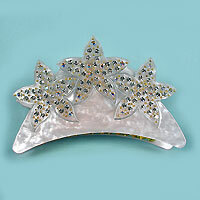 Measurements: width 1", length 3-34"
Plastic claw with a rhinestone studded gold and silver star design. Includes metal teeth. 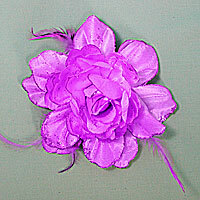 Measurements: width 2", height 4", length 2"
Small puffy bow on French clip barrette with streamers. 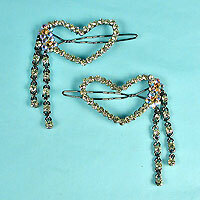 Measurements: width 4½", height 2-1/4", length 9"
Set of two small crystal rhinestone hair clips set in antique look metal. 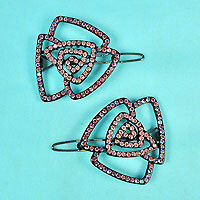 Measurements: width 1/2", length 1½"
Set of two open work crystal rhinestone barrettes in a rose design. 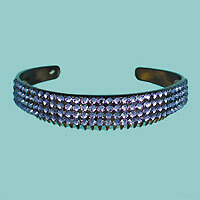 The iridescent rhinestones shimmer with different colors. 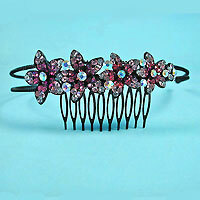 Measurements: width 1-1/4", height 1½"
Crystal rhinestone headband fashioned with five flowers. The flowers on this headband stretch across about four inches. The double wire band is black and a black metal comb keeps the band in place. 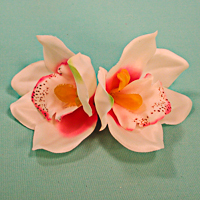 Two orchid flowers on an alligator clip. 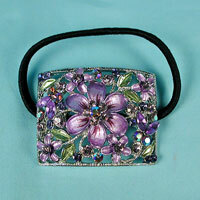 These beautiful flowers can be worn on the side of the head or in back. 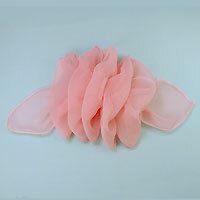 The are made of a soft molded fabric with vibrant colors. 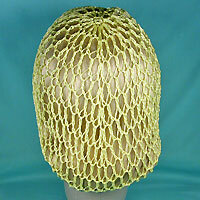 Measurements: width 5", height 2½", length 2½"
Elegant rhinestone studded bun snood. There are small claws on either side of the snood to secure it to your hair. Measurements: width 5", height 1", length 5"
These are large print bows on satin and chiffon striped fabric. They are mounted on a 3-inch salon jawbone claw clip. 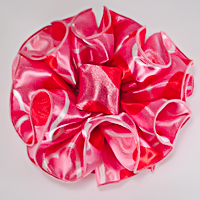 These bows are six inches in diameter and come in several holiday prints. Color: pink. Hue: pink. color code: #FF97D4. Type: heart. 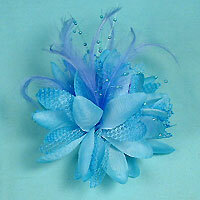 Measurements: width 6", height 3", length 6½"
Large fabric flowers with lace, feathers and beads. 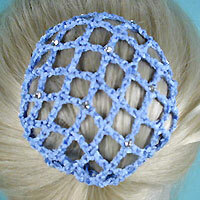 This beautiful hair accessory has both a pin and a clip so it can be worn on a top or a hat. 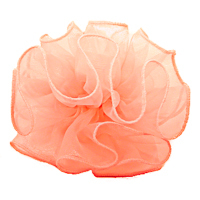 Measurements: width 4-1/4", height 2-1/4", length 4-1/4"
Color: peach. Hue: apricot. color code: #FFC365. 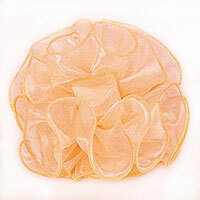 Color: golden peach. Hue: golden peach. color code: #F9DAB5. Ponytail bob in five metal rhinestone decorated sections over elastic bands. Bands end in silver balls that secure the bob on your ponytail. Sections are decorated in a crystal rhinestone flower design. 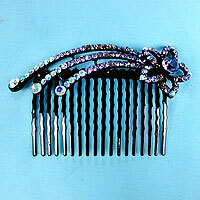 Measurements: width 2½", length 1"
Plastic comb with a crystal rhinestone shooting star design. 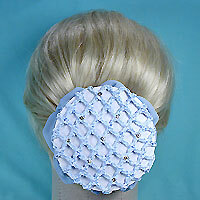 Includes three streams with larger rhinestones at the end. 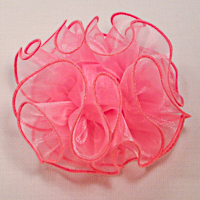 Measurements: width 3-1/4", length 1-7/8"
This scrunchy is an elastic band covered large beads and used to fasten the hair, as in a ponytail. You may want to wrap it around two or three times. 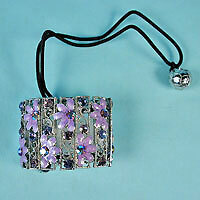 The look is sparkly with faceted Lucite square beads. 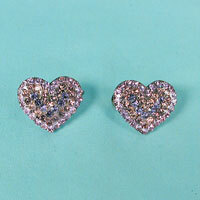 Measurements: width 1", length 3½"
Set of two tiny crystal rhinestone heart barrettes. 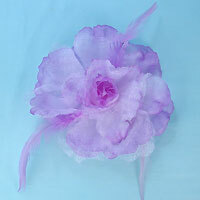 Measurements: width 3/4", height 5/8"
Large rose flower and feather hair clip and pony tail elastic. 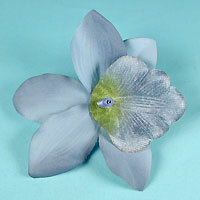 The color of the flower varies from light to dark the petal edges are trimmed with glitter. 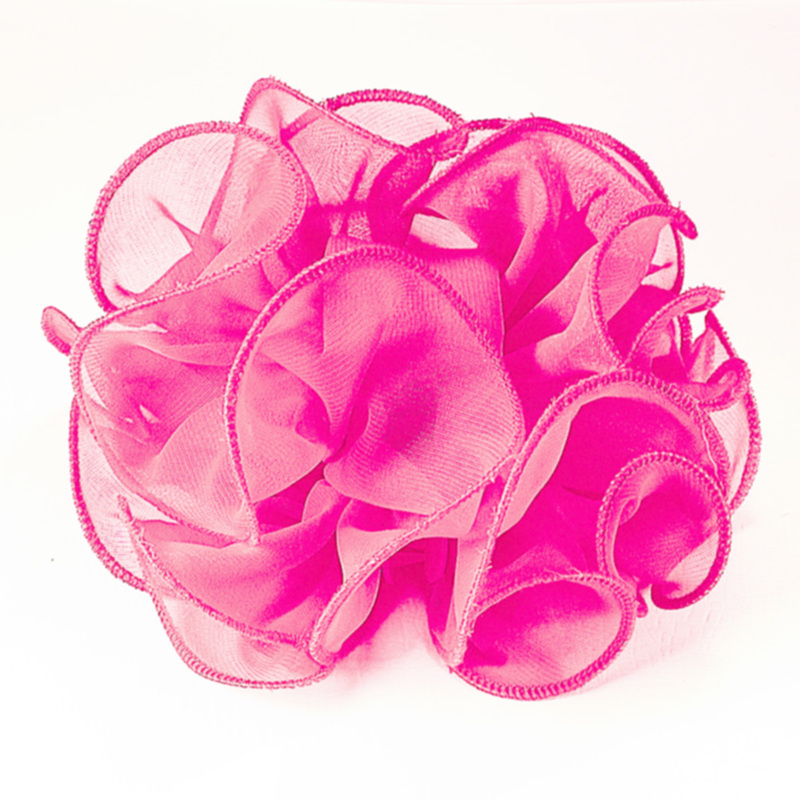 Its a beautiful hair accessory for day or evening. 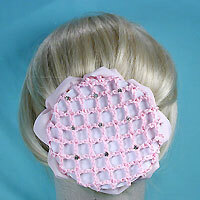 Measurements: width 5½", length 5½"
Plastic headband with four lines of crystal rhinestones and a wide comb underneath to secure it in your hair. 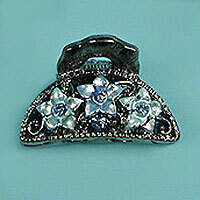 Ponytail holder with small and large flowers fashioned with enamel and rhinestones on a fillegreed frame. Color: lavender. Hue: lavender. color code: #EA97FF. Type: silver. 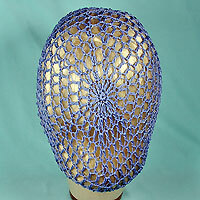 Measurements: width 1-3/4", length 1-3/8"
Crocheted hair bun cover snood. 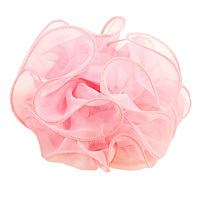 This hair net accessory gives your hair a sophisticated, old fashioned look or ballet dancer look. 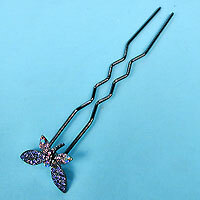 Measurements: width 4", length 4"
Long metal hairpin with a crystal rhinestone butterfly decoration. 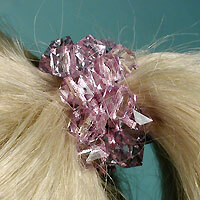 Measurements: width 1", length 4-1/4"
Large French clip shiny hair bow in several colors. 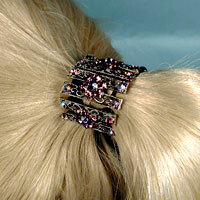 Attached a 3-inch metal spring closing barrette, or French clip, these bows are great for day and evening. They work well with both thick and fine hair. 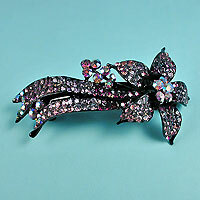 Measurements: width 5", length 7"
Crystal rhinestone flower barrette with pointed petals and streamers. 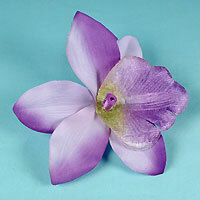 Measurements: width 1-3/4", length 3½"
Fabric flower clip fashioned in an orchid design. This flower is made in a two tone color design. 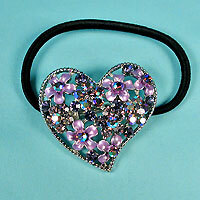 Measurements: width 4½", length 4½"
Ponytail bobs fashioned in a heart shape with small enamel flowers and crystal rhinestones. Measurements: width 1-3/4", height 1½"
Pony tail fastener fashioned in several sections of filigreed silver metal and decorated with enamel flowers and crystal rhinestone accents. 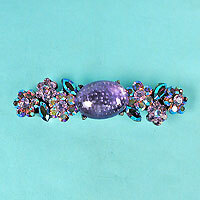 Measurements: height 1-14", length 3½"
Barrette with center oval cabochon stone and iridescent crystal rhinestones in a flower design. 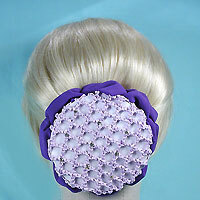 Measurements: width 2-5/8", height 5/8"
Flower hair clip with pony tail elastic. 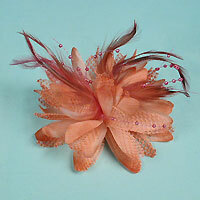 These beautiful silk flowers have sparkling gause overlays and feather trims. 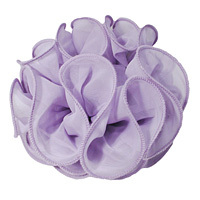 Measurements: width 4-7/8", height 2", length 4-7/8"
Color: lavender. Hue: pale lavendar. color code: #D6D6F2. Color: gray blue. Hue: Gray Blue. color code: #63A1E8. Color: gray blue. Hue: fog. color code: #D6BBF2. 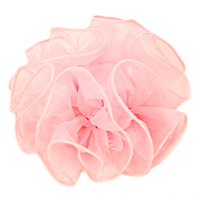 Large French clip puffy chiffon hair bow. 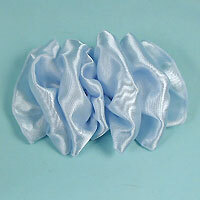 These bows use a 3-inch metal spring closing barrette, or French clip, to securely attach to either thin or thick hair. Bows with "RH" in the part number have a few rhinestones in the chiffon. 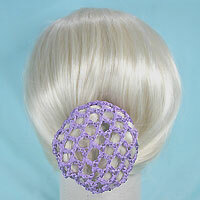 Measurements: width 6½", height 4", length 5-1/3"
Crystal rhinestone studded crocheted hair bun snood. The rhinestones add a little sparkle to the bun. Color: light blue. Hue: mist. color code: #D6E1F2. Tiny filigree metal claw with painted flowers and crystal rhinestone trim on sides and top. Measurements: width 1", height 7/8", length 1-3/8"